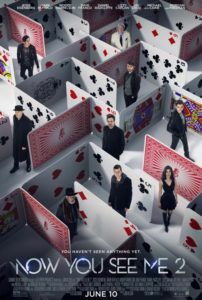 After reviewing Now You See Me in 2013, I was content to never think about this underwhelming, plot twisting yarn about Robin Hood-esque magicians ever again. Hollywood had other plans. Critics overall gave Now You See Me unfavorable reviews, resulting in a 49% score over at Rottentomatoes. And to my knowledge, audiences in general were not clamoring for more. However, the original earned over $350 million in worldwide box-office receipts on a $75 million budget, and because the production company, Summit Entertainment, had just finalized its Twilight series, and moreover is experiencing diminished interest in their Divergent franchise, the studio no doubt felt obligated to milk a profitable release for everything it’s worth. And so, here we have Now You See Me 2, an absolutely forgettable, overly plotted, unnecessary dash for sequel cash. 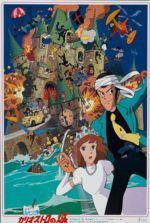 Once again, the story follows a group of magicians who, while performing sold-out shows for mindlessly enthused audiences, somehow find themselves tangled in an elaborate heist scheme involving corporate espionage, which ultimately leads to the grand reveal of a long con. That was the structure of the first one, and the sequel follows it to the letter. Returning from a hiatus, the magicians known as the Four Horseman make a comeback. 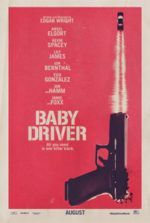 Jesse Eisenberg plays hotshot illusionist J. Daniel Atlas, Woody Harrelson plays hotshot hypnotist Merritt McKinney, and Dave Franco plays hotshot sleight-of-hand artist Jack Wilder. The original’s Isla Fisher opted not to return, allowing Lizzy Caplan to take her place as the token female, Lula, a hotshot prankster. And while Ed Solomon’s screenplay is quick to point out her obligatory role as the sole woman (perhaps to make light of Fisher’s absence), its self-awareness doesn’t make Caplan’s formulaic presence feel any less obligatory. When their big comeback show goes unexpectedly wrong, the newly assembled Four Horsemen rush offstage and find themselves instantly transported to China. Now in Macau, the Horsemen are coerced by an evil Zuckerbergian villain named Walter Mabry (Daniel Radcliffe, having fun playing a character with no real magic) to steal “the stick”—a computer chip MacGuffin capable of decrypting any computer on Earth. (You might ask, But can it decrypt computers in outer space? That point of logic is never addressed.) Radcliffe’s megalomaniacal baddie seems cut from the same cloth as Eisenberg’s Lex Luthor in Batman v Superman: Dawn of Justice, except not so awfully realized. 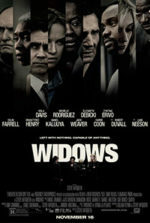 Meanwhile, Mark Ruffalo’s Dylan Rhodes, still serving as both the Horsemen’s behind-the-scenes ringleader and an FBI agent, searches for the Horsemen’s whereabouts and reluctantly teams with magic debunker Thaddeus Bradley (Morgan Freeman), who Rhodes had jailed at the end of the first one. The sequel also gives Dylan a cornball backstory about how, as a boy, he watched as his failed magician father drown to death, and he blames Bradley for it. And, if you recall, Rhodes was also revealed as a grandmaster magician responsible for virtually everything between the opening and closing credits of the original, answerable only to a secret society of magicians called The Eye. Everyone in Now You See Me 2 keeps asking about the identity of The Eye, but the answer isn’t very interesting. Even more convoluted is a subplot about Merritt’s evil twin brother, also played by Harrelson. Admittedly, the character offers some laughs at first, but the gimmick grows tiresome. Michael Caine returns as Arthur Tressler, a dastardly insurance magnate with revenge on the brain. G.I. Joe: Retaliation (2013) helmer John M. Chu takes over directing duties from Louis Letterier, applying a somewhat less scatterbrained visual style than its predecessor. A couple of well-choreographed sequences manage to keep our interest, such as when the Horsemen break into a secure tech facility to obtain “the stick”—it’s a slick set piece, clearly influenced by Brian De Palma’s Mission: Impossible. But there’s no real magic to the proceedings; even though David Copperfield serves as a co-producer and magic consultant, most of the tricks appear to be accomplished with CGI and editing. After all, when the Four Horsemen experience magical transportation from the U.S. to Macau, that’s not a magic trick, that’s a cut on editing software. NYSM2—as the film’s marketing materials call it, but no one in the real world will call it—tries to fool its audience with visual stunts and endless turns of plot. Neither are very effective. Solomon’s screenplay also contains a few racial stereotypes about Chinese culture (a gong plays a major role in one scene) that are nothing short of embarrassing. For a momentary diversion, watching this likable cast banter and throw barbed jabs at each other proves fun. Those who find joy in watching a film in which the cast appears to be having a good time behind-the-scenes will enjoy Now You See Me 2. But Solomon’s attempts to imbue the material with any emotional connection whatsoever remain fruitless, and the film ends up being nothing more than a glitzy, empty bauble. After all, most of the main cast can and have held together entire films on their own, and yet each of them appears to be phoning it in here, allowing the overstuffed plot and empty showmanship to do all the work. Summit Entertainment gathered together a lot of talented people and paid a hefty price tag ($90 million, reportedly) for a film no one asked for, and Chu directed a film few people will remember. Alas, Chu has already signed to direct Now You See Me 3 for release in a couple of years; and just think, by that time you’ll have completely forgotten Now You See Me 2 ever existed.